Ian Dove has built a replica of the TransEurope Engineering TE2800 for use at classic rallies. If you haven't heard of a TE2800 before and think it looks like an Opel Manta A series on steroids, you'd be correct. TransEurope Engineering bought partially built bodies from Opel, re-engineered the body and suspension, then squeezed a tuned (142 bhp) 2.8 litre Opel six cylinder engine and gearbox into a Manta shell with appropriate modifications to the running gear. Performance was: 0-60 mph in 7.6 seconds, 0-100 mph in 22 seconds, and a standing start kilometre in 29.2 seconds. Top speed was 130mph. Bodywork was similar to an Irmscher body kit with a bonnet bulge. 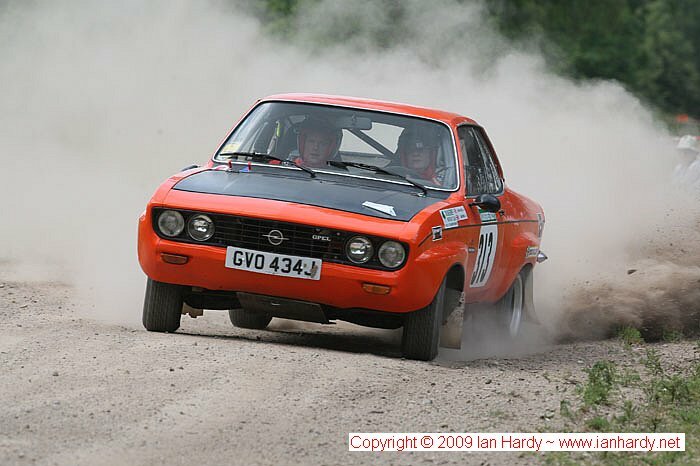 A rally version was also produced with an engine tuned to give 230 bhp. Some other special parts fitted were Recaro rally seats, 7" alloys, vented discs, LSD, Nardi steering wheel and uprated suspension. I was able to supply Ian with an assortment of bits and pieces during his build up. He mailed me because his servo had packed up and I knew there was one in the loft, but could I find it? It had somehow got into a box of cables! Once found I was able to get it boxed and sent off by courier the next day. Hello Mark, I did some work on the doves car when they were building it and i cant find their details to contact them. Would you be able to pass on a message for me. if so can you tell them that Ryan from exell motorsport wants to talk to them about another manat a rally car build. Oops, I haven't been checking for fresh comments recently, in winter the SkiBiker SkiBike Blog at http://www.skibike.me.uk/ gets all the attention. I will pass your message on, I hope it isn't too late.